I think I’m a convert. After all, it only takes a quick lop off of the tops and a scooping out of the seeds and you’ve an instant casing for a yummy filling. And that sure beats faffing around with pastry in my book. (Plus it’s healthier). You know how you start out thinking a recipe will be one thing and then it’s something entirely different. This dish was originally going to be peppers stuffed with some kind of interesting rice. Then I found myself with meat that needed eating within 24 hours (already defrosted so no I couldn’t just freeze it) and the realisation that the rice I’d cooked also needing eating up within 24 hours and couldn’t be reheated more than once. Since the cooked rice would be heated inside the peppers, they had to be eaten immediately. Only I now needed stuffed peppers that could be reheated the next day because they’d not all get eaten blah de blah de blah. So that’s how they came to be stuffed with chilli and I’m extremely glad they did. Still tinkering with my Gran Luchito smoked Mexican chilli samples I wanted a spicy filling… first I fried two onions with garlic, next I added tomato puree and a little water (but not chopped tomatoes), a pack of soya chilli mince and a can of black eye beans. And a teaspoon of Gran Luchito smoked chilli paste. As you can see, this would be a meal in itself, either served with rice or rolled up in tortillas, maybe with some avocado and salad. 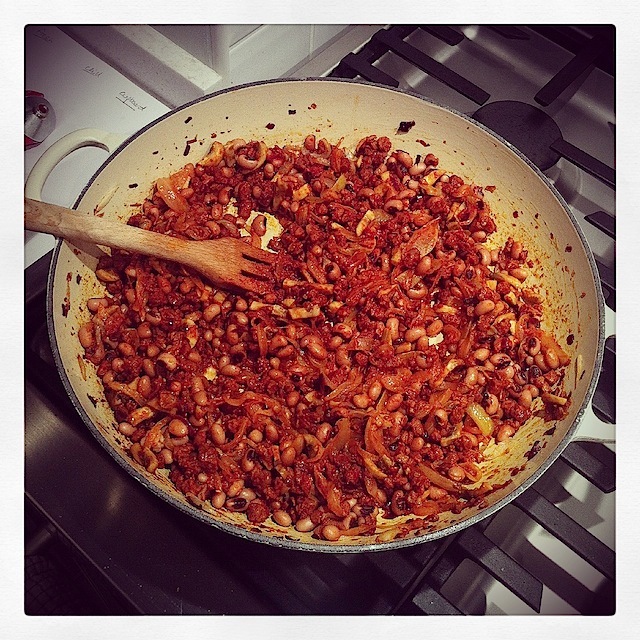 For a final dimension to the chilli I added a handful of toasted almonds. A note on the soya chilli – I’ve had a nightmare buying this lately. I’m not vegetarian but I have a regular ritual of making soya chilli on Sunday evenings (we call it “Taco Night” – which if you watched LOST, you’ll appreciate the reference). Most supermarkets have stopped stocking dried soya mince for no apparent reason. Tesco and Holland & Barratt are only selling a pale anaemic unappealing white dried soya mince. I find it really odd that what’s presumably a staple product for many vegetarians has virtually vanished from supemarket shelves. 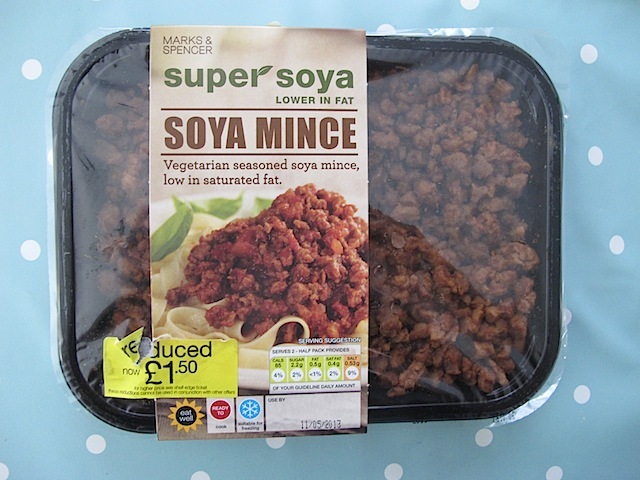 So I was delighted to discover packs of non-dried dark brown soya mince in the chiller cabinets of Marks & Spencer. I was less amused by the £2.99 price tag but managed to scoop up 3 packs reduced to £1.50 each. It freezes beautifully and has a much better texture and flavour than the old style dried variety. My fear however is that M&S will not stock this stuff for very long. So grab some if you see it. 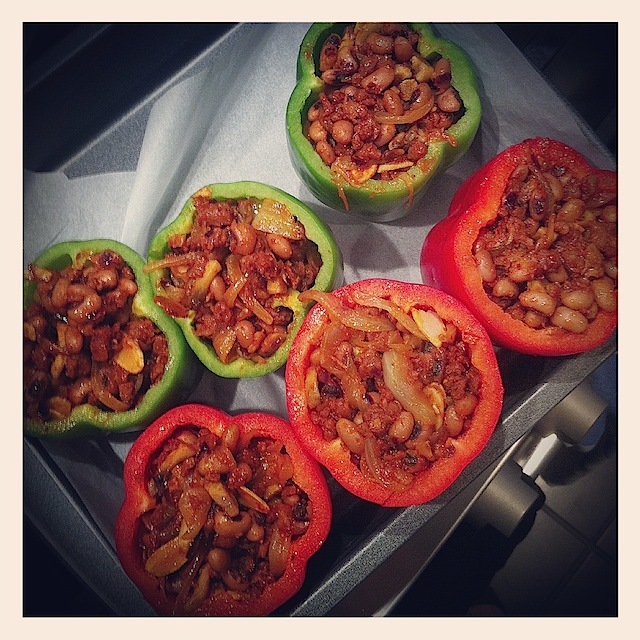 Once your chilli is made, spoon it into the pepper cases propped up inside a deep square baking tin. Replace the lids, squirt with olive oil spray (or drizzle the normal stuff) and bake at 200c / Gas Mark 6 for 25 minutes. Keep an eye on the pepper tops towards the end as they’re vulnerable to scorching which you want to a point. Serve the stuffed peppers alongside rice. They reheat well the next day too. A squib of barbecue sauce goes with them very nicely. 2 medium onions, finely sliced into half moons. 1. Preheat the oven to Gas Mark 6 / 200c. Slice the tops off the peppers and scoop out the seeds. Trim the pepper stalks from the lids and set aside. 2. Fry the onion in the olive oil in a large flat pan. Once softened add the lazy garlic and continue to fry gently until golden. 3. Turn the heat down and add the tomato puree and smoked chilli paste. Add a little water to stop it sticking but not to make a wet sauce. 4. Stir in the soya mince and black eye beans and warm through. Finally stir in the toasted almonds and turn off the heat. 5. Spoon the chilli into the pepper shells. Stack them against each other upright in a deep baking tin. Once filled replace the lids and squirt tops with olive oil spray. 6. Bake for around 25 minutes until the peppers are cooked and serve. Have you ever stuffed a pepper? 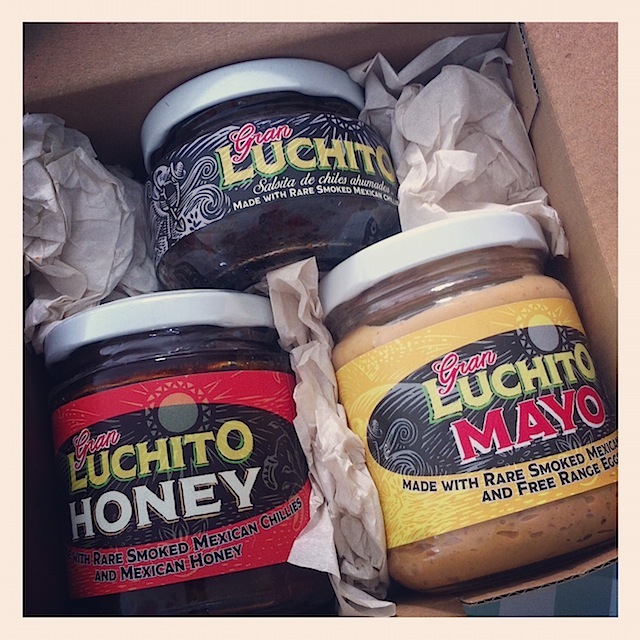 With thanks to Gran Luchito for product samples.